Jan Smith was born in 1961 in New Orleans, Louisiana with an upbringing steeped in social activism, art, music, and culture. Jan’s mother is an artist and educator, and taught in inner city high schools during the 60’s and 70’s, creating inspiring, and relevant curriculum, and supporting cultural literacy during a time when southern schools didn’t mention African American contributions to art, history, politics, or culture. Her father was an internationally respected documentary photographer, and cultural historian, who worked unceasingly to preserve the New Orleans’ inner city which he saw as the birthplace of not only the music, but the heart and the vibrant aliveness of the city and people that he was so committed to. Jan’s commitment to social justice, and her deep appreciation for the importance of art and culture was fostered by her parents’ example. Jan is a mother, wife, mentor, cook, writer, artist, and farmer. Jan’s introduction to permaculture came in 2002 with a visit to the Bullock’s Permaculture Homestead on Orcas Island, and in the same year a trip to Spirit Pine Sanctuary on Figueroa Mountain in southern California during a Cob Cottage Company natural building workshop led by Ianto Evans and Betty Seaman. Pursuing a deepening interest in growing food and building sustainable shelter as a means of regenerating culture, Jan worked as the orchard manager for La Casa de Maria retreat center in Montecito, CA, a farm hand for Marshall Chrostowski at Pacifica Graduate Institute in Summerland, CA, and nursery manager for Island Seed and Feed in Goleta, CA. 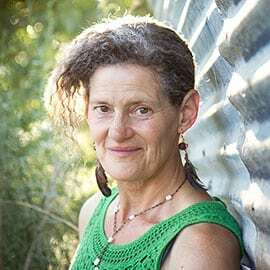 She also studied natural building with Alejandra Caballero in Tlaxcala, Mexico in 2006, and has volunteered, and assisted on various natural building projects in southern California. In 2005 Jan and her husband, Brenton Kelly, made their first visit to Quail Springs. Shortly thereafter they joined the Quail Springs Board of Directors, and Jan began to assist with grant writing for the organization. In 2008 Jan and Brenton joined the Quail Springs onsite crew with the commitment to help grow the farm, steward the land, teach, and develop educational programs to share permaculture with visitors and students. Since living and working at Quail Springs Jan recorded the album, 14 Stories, a collection of original songs, and joined other Quail Springers to form the band, Cuyama Mama and the Hot Flashes.